Could Acupuncture help your pet? Whilst acupuncture has been a cornerstone of traditional Chinese medicine for centuries, it has been growing in popularity worldwide over the last few decades. 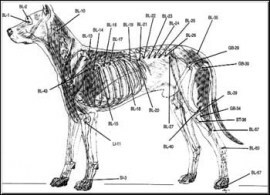 With scientific evidence supporting it's use for treating pain, many human GPs and vets now use acupuncture as an adjunct to conventional medicine. It is most often used to treat lameness and pain and to relieve muscle spasm, but can also be used in the treatment of a range of other conditions including some types of skin, digestive and bladder diseases. Those animals that benefit most include pets with chronic pain due to hip dysplasia, elbow dysplasia, OCD, ligament disease and other causes of osteoarthritis, as well as animals that are rehabilitating after injuries and surgery. Where necessary, acupuncture can be used in addition to medication that reduces pain and inflammation, and can also be used alongside other therapies such as physiotherapy and hydrotherapy. Acupuncture involves placing very fine sterile needles through the skin in positions where they can have an affect on the animal's nervous system by stimulating the release of neurotransmitters. The needles are so fine that pets don't normally resent them, in fact some animals find acupuncture treatment relaxing or even mildly sedating. The needles are left in for up to 20 minutes and then removed. Treatments are normally repeated weekly for 3 or 4 weeks and then at increasing intervals as the effect becomes more long-lasting. Animals with chronic disease may benefit from regular 'top-up' treatments every 3-4 months in the long term. Acupuncture is very safe. Mild bruising may occasionally occur, and animals may experience a little muscle tenderness the day after treatment, though this passes quickly. Side effects are extremely rare. If you think that acupuncture might be appropriate in your dog or cat's case, or if you would like more information, please get in touch. 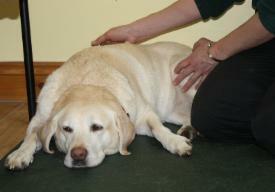 A referral for acupuncture treatment can be arranged, after liasing with the animal's usual vet. Roberta Baxter qualified as a Vet in 1993 and a Veterinary Acupuncturist in 2001. 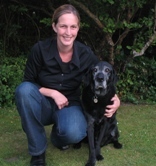 She has worked in Norfolk and Suffolk for over 13 years, combining conventional veterinary treatment of small animals with acupuncture and other therapies. Whilst continuing to work in veterinary practice, Roberta can also treat pain and associated conditions in small animals in East Anglia on a referral basis. Roberta is a member of the Royal College of Veterinary Surgeons, British Veterinary Association and the Association of British Veterinary Acupuncturists. Acupuncture treatment in the UK can only legally be carried out by a qualified vet who is also trained to use acupuncture.